"The selling price has been lowered to $575,000 cash only. New subdivision across road of 7 acre lots selling for $500,000 start. 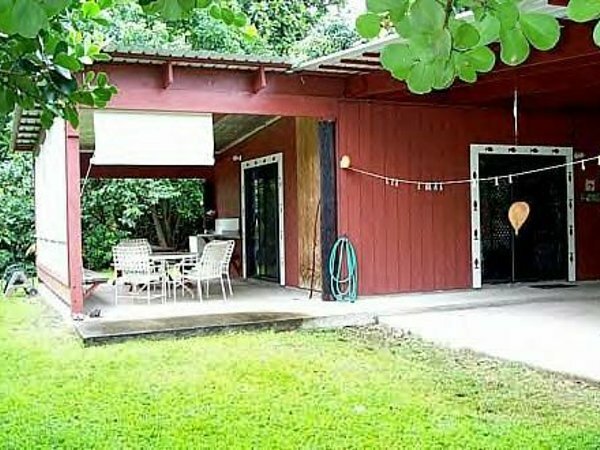 Another property on the Big Island of Hawaii is for sale $290,000. With a 2 story multi unit building and buildable lot next door for $20,000. Offers accepted." Is the lodge currently in operation? "No. Only long-term rentals are now allowed (for more than 6 months)." Built-up Area: 8,000 sq. ft.
Materials of Construction: Cement floors, eucalyptus, redwood and cedar walls, metal roofs (need replacement). The Flower Studio has a double carport with a black top floor and a black top floor patio. The Marine Studio has a cement double carport and cement patio. The studios are back to back. Sliding glass entrance doors. Flower Studio need a new key lock. All gas appliances for hot water, stoves and refrigerators. Ecological Features of the Property: 10 of the 27.5 acres are planted as a walkable botanical garden. It is cared for as organic as possible, but we do have some very aggressive trees and weeds that we have to keep under control with poison. We have many tropical flowers and fruit trees. We sometimes sell. There is a very large farm house and two separate back to back studios with private baths and kitchens. Energy-Saving Features: We are off the grid with solar electricity and satellite TV and Computer. No phone. Gas appliances for hot water, stoves and refrigerators. Environmental Conservation Features: Because the area has sufficient rainfall, we do not have to water the garden. However, we are connected to a private system of well-water. We, also, have our own well, but it needs to have a solar pump installed. The safest swimming beach with sandy beach is at Hana Bay Park in Hana Village. Just about 3 miles. There is a surfing area about 5 miles past Hana Village. But that is not a safe swimmers beach. You have to know the water currents. Nearby Attractions (within 50 km): Just a half mile from our Gardens is a Lava Tube Cave Park and a National Tropical Gardens a National registered archaeology site. 3 miles is Waianapanapa State Park with black sandy beach and caves. Past Hana is the surfing beach and Hamoa Beach Park a lovely sandy beach. 11 miles past Hana is the bottom of the Haleakala National Park some people call Seven Pools. The correct name is Oheo Gulch. It has Park Rangers and a lovely hike through a bamboo forest and highest waterfall on Maui. Best way to reach the property from abroad, by public transport and private transport: Airplane travel from Europe and mainland USA to Kahului Airport on Maui. There are several bus tour operations, but the best way is to rent your own car for travelling in Hana. There is no public transportation. Any other points: There is a large area by the buildings of black top paving for parking. I would guess a quarter of an acre. It is old but in good condition. The rental studios are away from the farm house by about 100 ft. The buildings sit on the front edge of the property next to the county dirt road of Ulaino Road. There are nice neighbours Hana village side and across the road and shallow stream.